Trip moldboard design with 10 gauge brake formed skinplate. Moldboard reverses 35 degrees either side of the bulldoze position. Two 3-1/2” diameter bore by 16” stroke reverse cylinders. Two point level lift chain arrangement or roller level lift arrangement available. Oscillator bar with 1” flame cut ears on 31” centers. Ram reverse or worm gear reverse options. 1/2” by 8” C-1085 cutting edge. Cutting edge backer angle punched on 8” and 12” centers. Moldboard and curb shoes supplied standard. Carbide blades and moldboard shoes. Mushroom shoes or 10” steel wheel caster assemblies. Trip moldboard design through four heavy duty adjustable tension springs. Reversible moldboard capable of reversing 35 degrees either side of bulldoze position. Reversing action provided by two 3-1/2” diameter bore by 16” stroke cylinders. 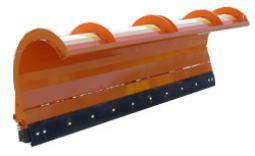 10 gauge heavy duty “C” curl moldboard. Moldboard shoes and curb shoes are standard items. Oscillator drive bar lugs are on 31” centers. Ram reverse or worm gear reverse option. 36” or 45” high moldboard curl. Carbide moldboard shoes and blade. Nominal 36” high moldboard tapering from the center line of the moldboard to 54” high at the discharge. Moldboard capable of reversing 35 degrees either side of the bulldoze position. Two 3-1/2” diameter bore by 16” stroke nitrided reversing cylinders. 10 gauge brake formed skinplate. 31” Oscillator drive ear centers. 1/2” x 8” C-1085 Cutting edge. Cutting edge backer angle punched on 8” or 12” centers. Carbide cutting edge and carbide moldboard shoes. Adjustable mushroom shoes or 10” Steel wheel caster assemblies. 36” high moldboard curl with replacable 3/8” polymer UHMW skinplate. 15 degree blade attack angle with heavy duty trip edge design. Moldboard reverses 35 degrees either side of bulldoze position. Hydraulic ram or manual reverse pushframes available. Two point level lift chain arrangement standard. Four 3/4” diameter wire by 13” long torsion spring trip edge return system. Heavy duty backer angle punched to accept 8” and 12” centers cutting edges. 1/2” by 8” C-1085 reversible cutting edge. The pushframe has a heavy duty 4” x 4” x 3/8” HSS pushbar spanning the three attachment points to the moldboard. Oscillator bar with 3/4” flame cut ears on 31” centers. Carbide blade and moldboard shoes. Mushroom shoe or 10” wheel caster assemblies. 36” high, 10 gauge brake formed moldboard curl. Heavy duty pushframe spanning three attachment points to the moldboard. Flexible 3/8” polymer UHMW moldboard skinplate. Change casting distances, direction, and moldboard shape, without slowing down. Twin ram reverse or worm gear. Oscillating drive bar and level lift chain arrangement. Self aligning bearings allow for proper positioning, while eliminating torsional stresses on the moldboard structural supporting members. Moldboard and wrap around curb shoes. 10” steel caster and mushroom shoe assemblies. 3/4” x 6” carbide cutting edges. 1-1/2” x 12” polymer cutting edge. Pin-on or weld on TOR-LOK coupler assemlbies. Parking leg — Screw jack type. 10 gauge steel sides and front. 10 gauge steel tailgate on 10’ and 10.5’ lengths. 7 gauge steel tailgate on 14’ length. Dirt shedding lower rub rails. 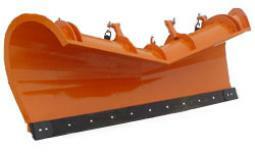 Retractable 10 gauge steel body headboard for increased capacity when used as a dump body (10’ and 10.5’ lengths only). 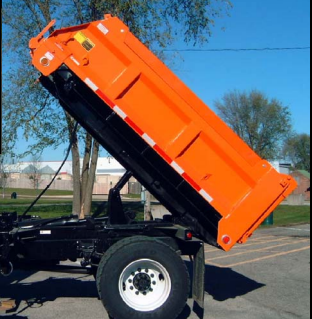 Conventional dump body and material spreader built together as one unit. 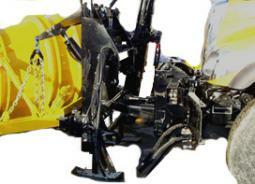 Double acting underbody style hoist designed for spreader/dump use. "Severe service" design for municipal use. High performance and low maintenance design. 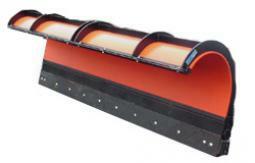 Removable conveyor cover for chain protection during summer use. 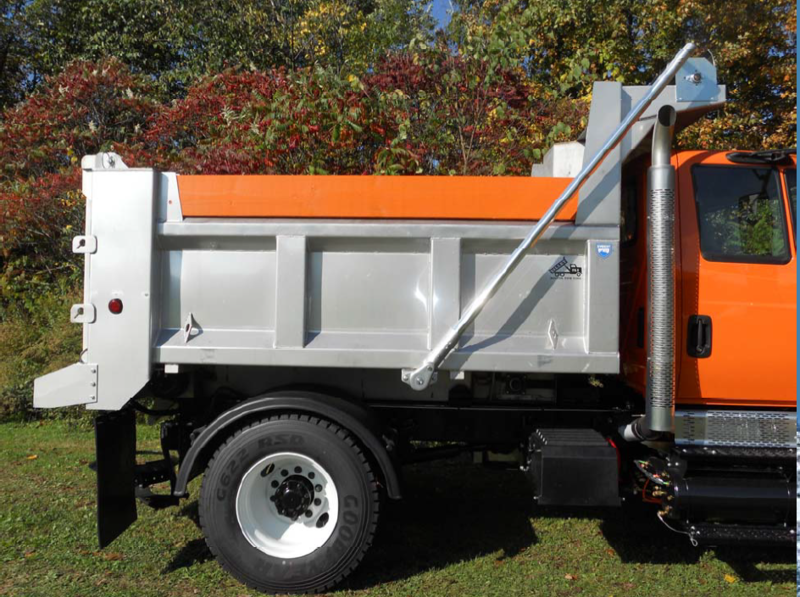 The Center Discharge Spreader body by Everest is designed for optimum spread patterns, excellent serviceability, maximum uptime and extreme durability to assure municipalities smooth running operations. Available with front, rear or front and rear discharge spread configuration. 28" chain width with bar flight on every link provides optimum spread patterns. Chain ends beyond rear discharge door – no winter/ summer kit or swinging coal door kit necessary, and no material leakage. Available in 304SS and carbon steel. Trapezoidal long sills and cross member-less construction for clean understructure. Standard floor AR400 material. 304SS floor available. Intended for truck chassis with greater than 35,000 pound gross vehicle weight. Heavy duty angle, plate, and tube construction for added strength. The bumper plate is adjustable for varying frame heights. 5/8" thick cheekplates designed for stress transfer to chassis frame rails. 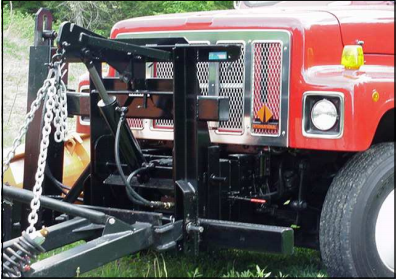 Hydraulically detachable front mast design permits off-season removal in minutes with upper and lower hydraulic mast locking pins. Power tilting for tilt forward cab design feature allowing the wing tower tilts with hitch. Twin 6" x 4" x 3/8" HSS crosstubes for wing tower mounting. 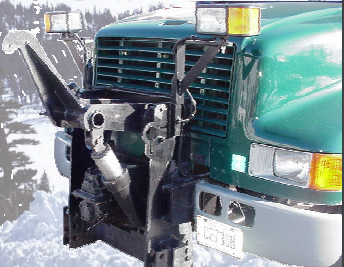 Hitch may also be used without crosstubes for plow mount only. 4" diameter bore by 10" stroke double acting nitrided lift ram cylinder providing over 16" of lift. Adjustable parking feet to allow for proper mast quick coupling and uncoupling. Three attach pin heights on 31" centers. Available adapter kit (not shown) for 21" centers. Designed to be used with medium duty trucks. All hydraulic rapid coupling system. 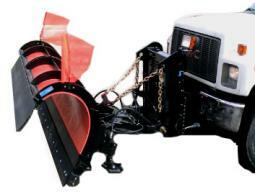 One man operation from cab (if used with reversible plow, plow reverse hoses need to be manually connected and disconnected). Approach guides help the driver line up the male and female section during coupling. 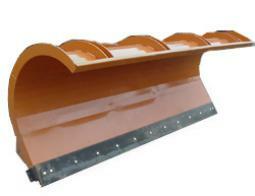 Female section can be mounted on most plow pushframes produced by major plow manufacturers. Hidden locking cylinder secures pin ears in place. 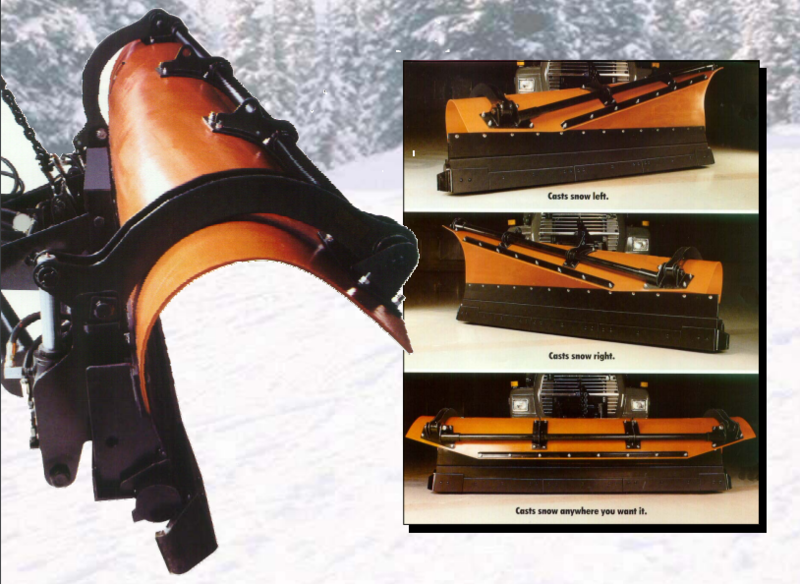 Adjustable bolt on plow pushframe attachment ears allows for various plow pushframe heights for added versitility. The hitch design allows for side wing mounting without modifications to the hitch mast or cheekplate kit. The hitch mast is designed for easy off, by removing four pins. Chain hooks for securing the female section to the plow pushframe supplied. Spring loaded female section support arms ensures proper angling and relief of female section during coupling. 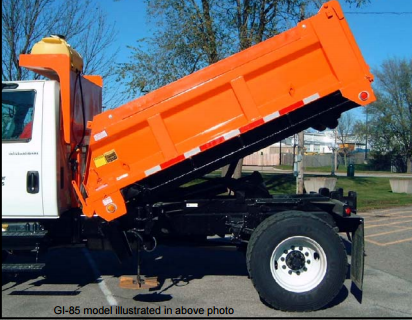 The “GI” series combination spreader / dump body gives you the capability to sand or salt roads during the winter season and use the unit as a conventional dump body to haul dirt and repair highways during the off season. The “GI” series changes quickly from dump mode to spreader mode with even weight distribution on both frame rails of the chassis.t hydraulic cylinders in the front post. By doing so, the cable and angle iron over the cab are unnecessary. 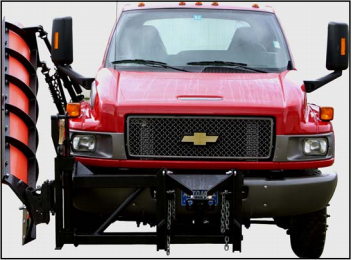 Designed for chassis with 17,500 minimum GVWR. Fixed integral passenger side with inner tilting floor and side plate. Two 2-1/2” bore by 16” stoke double acting inner side tilt cylinders. Designed to mount to GMC C5500 model chassis. 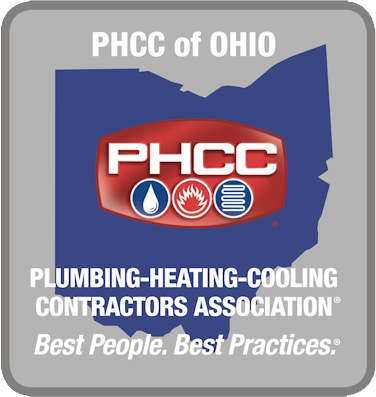 Pin on design permits off-season removal in minutes. Heavy duty angle, plate and tube construction for added strength. 3/4" thick upper attachment ears attach directly through chassis bumper to chassis frame rails. 3/8" thick lower cheekplates designed for stress transfer to chassis frame rails. 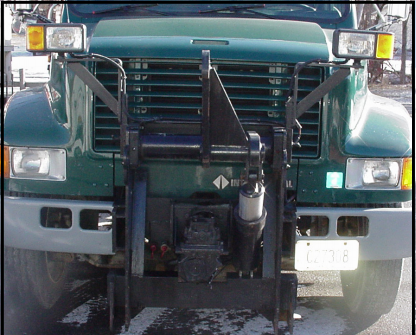 Low mount power tilting design for tilt forward cabs when wing system is attached (not required if plow only). Wing tower tilts with hitch. 2-1/2" diameter bore by 10" stroke double acting nitrided lift arm cylinder. Cylinder base angle is reinforced with 1/4" by 4" flat bar for added strength. Twin 4" x 3" x 1/4" HSS crosstubes for wing tower mounting. Three attach pin heights on 23-1/2" centers using 1" diameter mounting pins. Offset lift ram to allow for front mounted PTO. 4” diameter x 10” bore cylinder. Close fit to front of chasis to improve axle loading. Allows for three different plow pinning heights. Intended for truck chassis with less than 35,000 GVWR. Bumper plate is adjustable for varying frame heights. Cheekplates designed for stress transfer to chassis frame rails. Power tilting for tilt forward cab design feature. 3” diameter bore by 12” stroke double acting nitrided lift ram cylinder. Twin 4” x 4” x 3/8” HSS crosstubes for wing tower mounting. Three attach pin heights on 31” centers. Provisions for a front mount pump. Available adapter kit for 21” centers. Tilt kit allows the hitch to tilt forward from the base pin ear location to accommodate forward tilting truck cabs and engine hoods. Chain hooks for securing female section to plow pushframe supplied. 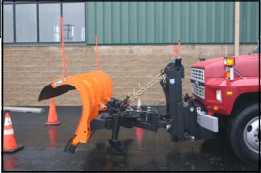 One man operation from cab (if used with reversible plow, plow reverse hoses need to be manually connected). Male section lift cylinder 4” bore by 12” stroke double acting nitrided cylinder with 2-1/2” double acting locking cylinder. 5/8” heavy duty cheek plate kit with 5/8” bumper plate ensure good load transfer and carrying for heavy duty use. 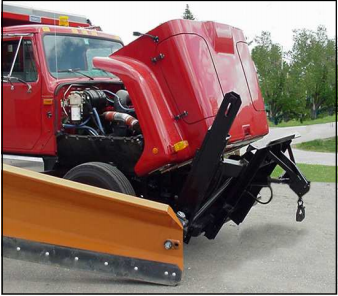 Withstands heavy duty, continuous plowing service. 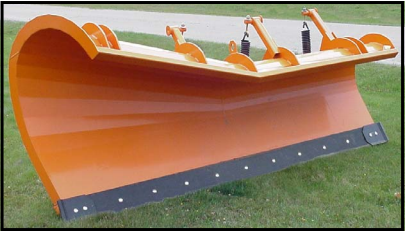 Female portion can be mounted on most plow push frames produced by major plow manufacturers.